All pieces are one of a kind as each agate is coaxed from it's geode one carefully planned cut at a time. Kentucky Agate is the State Rock by act of the State Legislature on July 14, 2000, It is a sedimentary agate found in the Borden Formation of Early Mississippian Age. 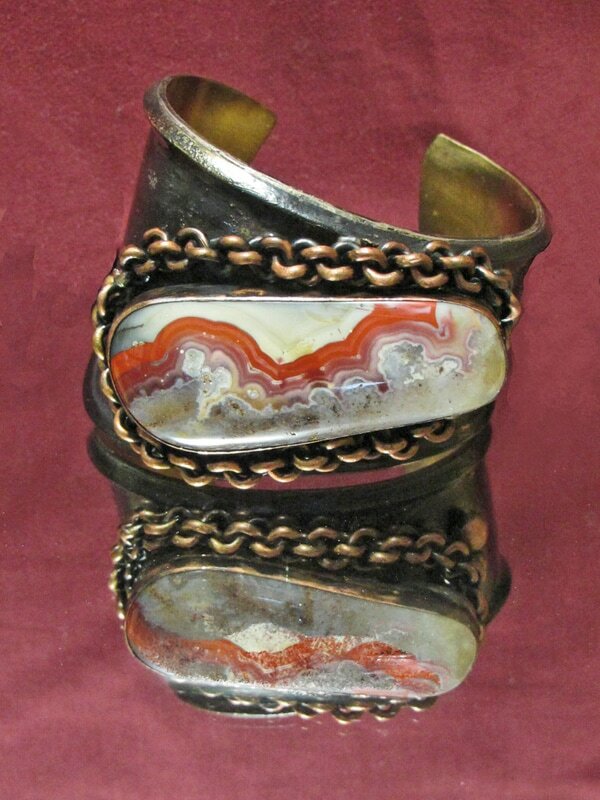 The agate is beautifully colored and contains bands, fortifications, and nodes. Sometimes the rarest and most unusual forms of agates are those obtained from the limestones and shales. There are at least three different types of concretions that had the cavities filled in with agates. Formed by expanding of fossils (or other nodules) by water or evaporate minerals such as gypsum that would later be dissolved to form cavities. Lastly, the hollow parts of the fossils would be filled in by agate. The agates were enriched in the minerals that would provide bold colors in many sedimentary type agate plumes, bands or moss formations. The origins of these beautiful and rare agates formed in sedimentary rocks and ancient seas have perplexed the agate experts, adding to the allure of these beautifully crafted pieces.